For thousands of years, silver has been used as a form of money and as a store of value. It is now popular due to demand in industrial applications, jewelry and ornaments. However, due to the small market size and speculative appeal, price volatility is higher for silver than other major commodities. The major silver producers are Mexico, Peru, Bolivia, Chile, Poland, Russia, China, Australia and the U.S. China is also the world’s largest importer of the precious metal. Trading in this precious metal is conducted at the two popular silver exchanges, the eCBOT (Chicago Board of Trade) and the COMEX (division of the New York Mercantile Exchange – NYMEX). Government reserves. The US government keeps silver in reserves and uses it for several purposes like minting coins. The government resorts to buying the metal in high quantities from the market when the reserves plummet, pushing up the demand. Industrial demand. Industries account for about 40% of the demand for silver. This metal is used in mirrors, electronics, batteries and photographic equipment, among other products. Demand from the ornament and silverware market. Demand from investors and speculators: This group accounts for 5% of the demand for silver. For example, purchases made by large investors can have an immediate impact on the demand and price of silver. Like trading currencies, online trading in silver with easyMarkets is “cash” settled i.e. there is no physical receipt of the underlying physical product. Futures: Trading takes place in lots of 5,000 troy ounces. Options: Trading takes place in lots of COMEX Division silver futures contract. Trading hours: Silver trading begins on Sunday 23:00 GMT and ends 22:00 GMT Friday night with a daily break between 22:00 to 23:00. Silver is mostly traded worldwide between 01:00 – 17:30 GMT, Monday to Friday, and that spreads are usually higher during out-of-business hours. Maximum Price Fluctuation: Maximum price fluctuation is in multiples of one-half cent ($0.005) per troy ounce (equivalent to $25 per contract). For straddle or spread transactions, as well as the determination of settlement prices, the price changes are registered in multiples of one-tenth of a cent ($0.001) per troy ounce equivalent to $5 per contract. A fluctuation of one cent ($0.01) is equivalent to $50 per contract. Futures: Initial price limit of $1.50 above or below the preceding day’s settlement price. Options: There is no limit to price fluctuations in options. Commodities and indices are traded as CFDs with easyMarkets and expire at 12:00 GMT. The expiration of each deal is displayed on your trade ticket, open position and on MT4 Market Watch. Traders can open positions in silver using the day-trading option to trade the precious metals at spot prices. Trading precious metals is now within the reach of private individuals via our trading platform, and like currencies, you are able to use leverage to enter into deals. As the price of silver rise, the price of the USD falls. 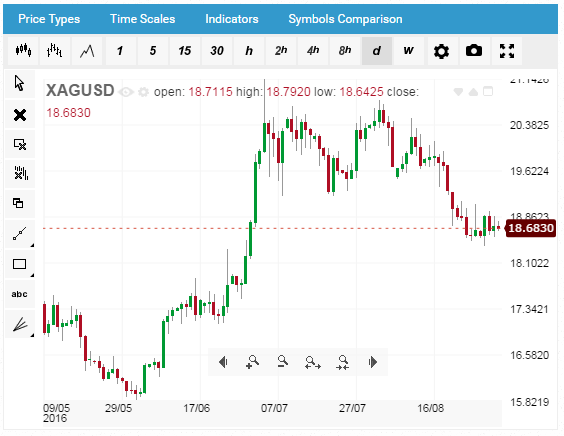 It is one of the reasons that trading silver has historically been a good way to “hedge” against inflation as silver tends to maintain its purchasing power over time. silver prices recently have been quite volatile making it a popular day-trading product. Why trade Silver with easyMarkets? Trade on Web, TradeDesk™, mobile and MT4. Trade silver spot and options. For more information on silver and other related trading products, go to our blog website, forex.info.